It’s no secret that I love being in the kitchen (well, except for doing dishes—hate that). And, in case you didn’t know, I love eating just as much as I love cooking—at a restaurant, at a friend’s house, from a food truck, or something I’ve made myself. Most everyone loves to give and receive restaurant gift cards during the holidays (and if you’re buying for me, I’ll take one to the Wine Kitchen, Cafe Nola, and Pistarro’s, please). Gift cards are a no-brainer because they’re safe. In the world of foodies, though, there’s so much more than a meal at a restaurant that you can give! 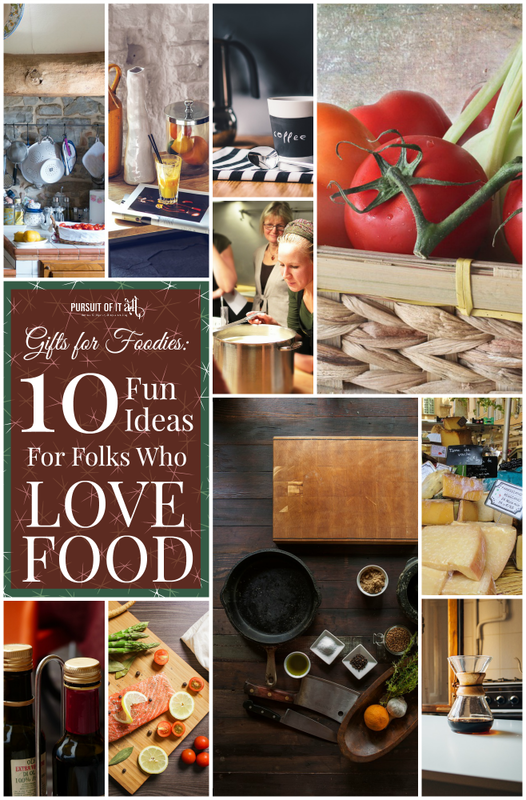 If you’re shopping this season for a food-lover like me, check out these 10 gifts for foodies—from gadgets to experiences, there’s a little something for everyone! 1. A new cast iron skillet. Cast iron’s where it’s at whether you’re sauteing a piece of chicken, frying burgers, or even baking a pie. A good, seasoned cast iron skillet develops its own non-stick surface that makes modern skillets pale in comparison. You can buy brand new cast iron skillets and other vessels online (Lodge is a great brand), but what a foodie would love even more is an old cast iron skillet found at an antique shop. Try scouring Emporium Antiques on Patrick St., if you’re near Downtown Frederick! 2. A class or two at The Kitchen Studio Cooking School. Whether you’re a novice or an expert in the kitchen, a grown-up or a kid, Christine VanBloem makes taking classes at The Kitchen Studio in Frederick a complete and utter blast. Buy a gift card for your favorite foodie, and she can sign up for options like knife skills or making sushi, all the while laughing and learning a thing or two with friends or other classmates. Not local? Guaranteed there are similar cooking school opportunities for experiences like this near you, though I can’t promise they’ll have as awesome a chef as Christine! 3. Really good oil and vinegar. Most foodies have a stash of everyday olive oil and vinegars in their pantry, but many probably don’t have the specialty varieties on hand like you’d find at Lebherz Oil & Vinegar Emporium (aka L.O.V.E. ), downtown on Market St., in Frederick. If you’re local, definitely stop in to sample the various flavored oil and vinegar options, and then select a few favorites for your foodie friends. Not local? You’re in luck! L.O.V.E. ships, so you can peruse your favorites online, and call to have the oil and vinegar mailed wherever you need. 4. A pour over coffee maker. A French press is one of my favorite ways to enjoy a cup of coffee because it makes such a smooth cup of joe. The latest craze in wonderful home-brew (and coffee shop cups, too) is the pour over method because it preserves the richness and robust aroma from the coffee grounds, while maintaining the natural oils. It’s often called “slow brew” because of this process. Bodum makes a great pour over coffee maker that has a reusable filter and is dishwasher safe, so your foodie friend doesn’t have to worry about stocking up on coffee filters, and clean-up’s a breeze. 5. A new wooden cutting board. Buying a CSA share means fresh, local food for your fridge once a month (or more frequently), and also helps support your area farmers. You can find monthly boxes that includes seasonal fruits and veggies, meats, breads, and even flowers! This holiday season, buy your foodie friend or family member a share in a local CSA, or give them the gift of a monthly delivery from a company like Hometown Harvest. Click here to learn more about community supported agriculture (CSA). You might not want to buy a pot rack for your food-loving friend (or maybe you do? ), but if you’re looking for a great idea for your spouse or partner, this could be it! With options that hang over a kitchen island, run across a wall, and include shelves or bars, there are tons of options out there that make hanging pots and other kitchen accessories practical and aesthetically pleasing! Bonus: you’ll free up cabinet space! 8. Chalkboard mugs, cups or canisters. Writing names on cups is the new wine glass charm, and it doesn’t get any cuter than with a chalkboard. From mugs to a set of mason jars, your friends can let guests’ chalk-writing creativity run rampant at their next barbecue! Chalk board canisters are also a fun gift, and can be used for flour, sugar, cookies or dog treats. If you’re feeling crafty, scour Pinterest for make-at-home chalk board options to gift! 9. A subscription to Bon Appétit Magazine. Sure, you can read their website, but there’s something magical about seeing food and recipes in print. Gift your foodie friend a year-long subscription to a classic: Bon Appétit Magazine. 10. A basket of fancy cheeses. Thrilled that The Kitchen Studio Cooking School made the list! Thank you!! You’re very welcome – it would make an awesome gift for any foodie (or foodie wanna be)!